Wait, what? No, we didn’t just make a mistake – you read that right. 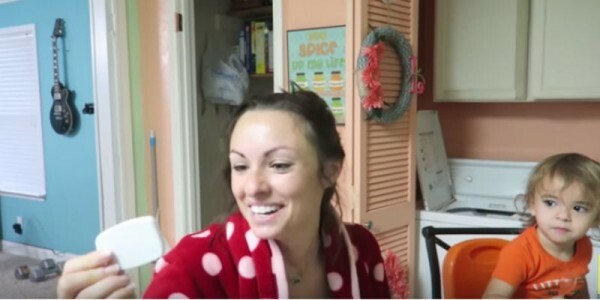 Watch the moment a husband catches his wife off guard with news they are expecting baby #3. How is that even possible, you ask? Let’s just say it involves a very clever husband, a pregnancy test, a dropper, a toilet and a rather familiar morning habit. Okay, mums, hands up – who sometimes doesn’t flush the toilet in the morning? I won’t lie. I do. All the time. Sometimes I forget. Sometimes I avoid flushing as there is a slight possibility it might wake my children and I wouldn’t get to enjoy five minutes of peace with my coffee. In any case, busy-mum-of-two Nia Rader didn’t flush one morning and her husband, Sam, took the opportunity to steal her pee and test if she was pregnant. Don’t believe us? Watch the video below. Make sure you stick around until the end – it is definitely worth watching, especially the reaction of Nia when she finally switches on to what her cheeky husband did. While pregnancy videos are all the rage these days, this is the first time we’ve seen a husband surprising his wife with the news. The father of two had a suspicion that Nia was pregnant after she told him she was two weeks late. “I can’t believe I am finding out like this!” Nia exclaims with a huge smile on her face after Sam produces a positive pregnancy test. The announcement takes the whole family by surprise, including the couple’s two young children. “You’re pregnant Daddy?” their daughter asks from the dinner table. And while it might seem a bit strange that the Raders are going about their morning routine with a camera in their faces, the couple, who are high school sweethearts and live in Texas, USA have a YouTube Channel dedicated to life with kids and random filming is part of the life for the soon-to-be family of five. We have no doubt that Sam and Nia will have a lot of fun with this pregnancy, and will be recording it every step of the way.